Setting an example for Republican and Democratic officials, Joshua Hosler, Vice Chair of the El Paso County Republican Party, removed a fake news item he shared on Facebook, after he learned it was fake news. 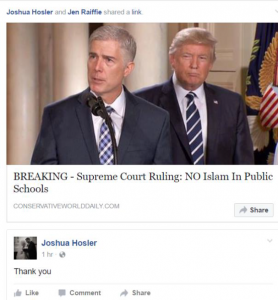 The item, produced by ConservativeWorldDaily, alleged that the Supreme Court, in a decision written by Justice Neil Gorsuch, banned the teaching of Islam in Public Schools. Hosler removed it, he told me via Facebook messaging. In deleting the item, Hosler joins other officials, such as State Rep. Polly Lawrence (R-Roxborough Park) and former State Rep. Kit Roupe (R-Colorado Springs), who both removed fake news from their Facebook pages last year in the wake of a BigMedia.org investigation. U.S. Rep. Jared Polis (D-Boulder) deleted a tweet with unsubstantiated information. Other officials, such as State Sen. Tim Neville (R-Littleton) and State Sen. Ray Scott (R-Grand Junction), did not remove fake news from Facebook. BigMedia.org’s “BigMedia Factcheck,” which posts facts on the Facebook pages of officials to alert them to the presence of fake news on their Facebook pages, spotlighted the fake-news item in Hosler’s Facebook news feed, and he subsequently removed it. Suspicious Facebook users have rightly flagged the bogus story as potentially fake, using the social media site’s improved tools for reporting a hoax. Hosler once ran for a State House seat held by former State Rep. Gordon Klingenschmitt but was defeated. This entry was posted on Tuesday, May 2nd, 2017 at 3:06 pm	and is filed under Facebook, fake news. You can follow any responses to this entry through the RSS 2.0 feed. You can skip to the end and leave a response. Pinging is currently not allowed.